Dennis and Anna Johnson give a reader’s theater performance of A.J. 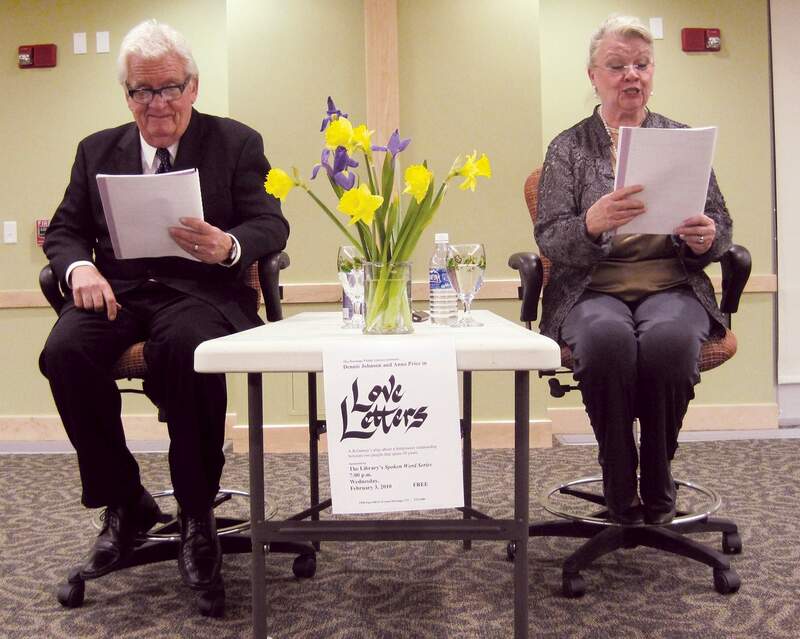 Gurney’s “Love Letters” in 2010 at Durango Public Library. 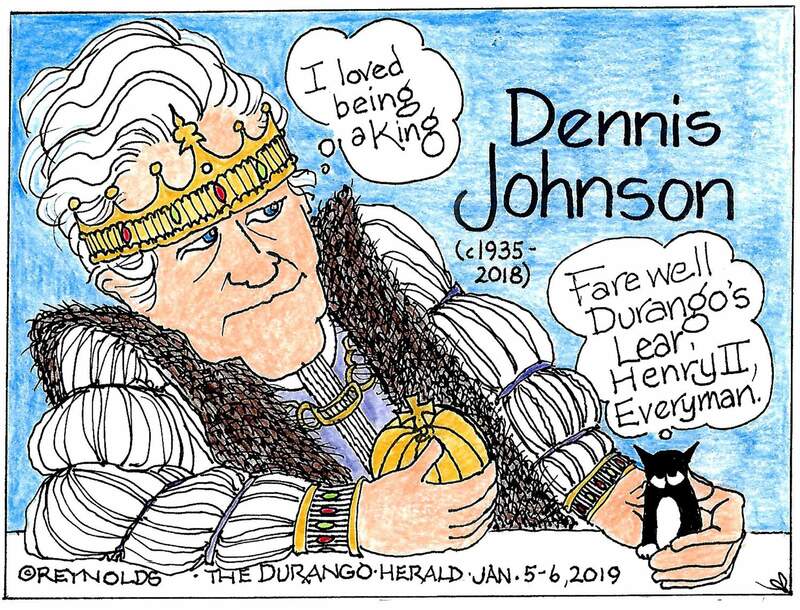 On Dec. 24, Durango lost a major force in the local arts community when Dennis Johnson died at age 83. Perhaps best known to most as co-owner with his wife, Anna, of Stuart’s of Durango for nearly 60 years, the Johnsons were also the founders of The Company, which was later renamed The Durango Repertory Theatre. Johnson also served on many boards in town, including Music in the Mountain’s. He and Anna also staged Music in the Mountain’s annual “Peter and the Wolf” event for children. A longtime actor (he got his start acting in 1959 at the Diamond Circle Theatre, his obituary said), Johnson will be remembered for nurturing community theater. Mona Wood-Patterson, co-founder, Merely Players“He and his wife, Anna, started this company and there was some other theater in town at that point, but he brought to it – and she, you really can’t discuss one without the other too much – they just upped the level of intelligent scripts, they were very dedicated to bringing newer work to Durango, but also they did a lot of classics. But they didn’t shy away from challenging pieces. And a lot of community-type theaters only want to do the traditionally lighter-weight scripts. And they were all in with amazing literature. That is something Dennis was fantastic at; he had such an eye for a great script. He just loved the medium and what playwrights could say, and he didn’t feel like it could only be done by professional actors, so in his theater company, there was a great mix of talent, and I loved that. In that sense, yes, the community got used to having intelligent, challenging and entertaining theater producers. Theresa Carson, Fort Lewis College theater department“This was a time when Fort Lewis was producing a summer Shakespeare festival. I graduated from grad school and I was up in Utah in 2000, and I got a job at Minnesota State, but I came here, I spent the summer here after graduating to direct a Shakespeare show. I was one of the two directors that summer, I believe it was the summer of 2000. I directed “As You Like It,” and interestingly enough, Dennis auditioned. I had known of him and Anna and their work, and he auditioned and both directors wanted him, and he picked me. Gregory Hustis, festival artistic director, Music on the MountainsHustis knew Johnson for about 30 years. Judith Reynolds, art critic, contributor to The Durango Herald “His volunteer life in Durango was essentially put into drama and live theater. There he was, a successful businessman on Main Avenue, so he belonged to that circle, and that whole enterprise, the commercial side of Durango, and then the artistic side. He and his wife just contributed so much. I started attending Durango Rep performances as soon as I moved here. I came to Durango in December 1994, so it would have been in the winter of ’95. And I started writing for the Herald in March of ’95, and I was writing previews and reviews of almost all of their productions. “Dennis and Anna were always a team, and they were what I would call in the English tradition ‘actor-managers’ of the theater company. And that goes way back in English dramatic history where the people who want to start up amateur or community theater had many talents: They can act, they can direct, they can manage the books, they can do the publicity, and that’s what Anna and Dennis did from the beginning. “One of the most memorable moments at a Durango Rep performance was when they stage ‘King Lear.’ It was all cast, all ready to open, and I don’t remember the name of the actor who was playing the lead, but he got sick and could not perform, so Dennis performed King Lear – a massive role. In order to do this, and not cancel opening night or opening weekend, he did the performance holding a script in his left hand and various props in his right hand. And for anybody who loves theater, Anna and Dennis were not strangers to reader’s theater, where you always have a script in front of you, you very quickly just forgot the fact that he was holding a script in his hand. He was so good, and he had good training and good instincts that he could do that and pull it off and not cancel the performance.